Since no one has posted the existance of the long awaited R45, I assume that we are out of luck for at least several more months. DDG indicates no promise for this year, however, it will come. Ahhh, the prosperity of it all; just get a bigger safe. Ummmm.... they did, in fact, display an R-45 prototype. I had a ball getting to handle the proto-type R45 at this year's Shot Show (and the Cerekote R9 as well). Great feel to the pistol and I'm looking forward to the pistol coming out in 2 years, from what the folks there told me. WOW! Would have loved to been there! What gun would you compare it to size wise? Ivan, Dennis, and Katrina - enough is enough! So I am somewhat surprised by the prototype. I addressed this a bit in the related thread. 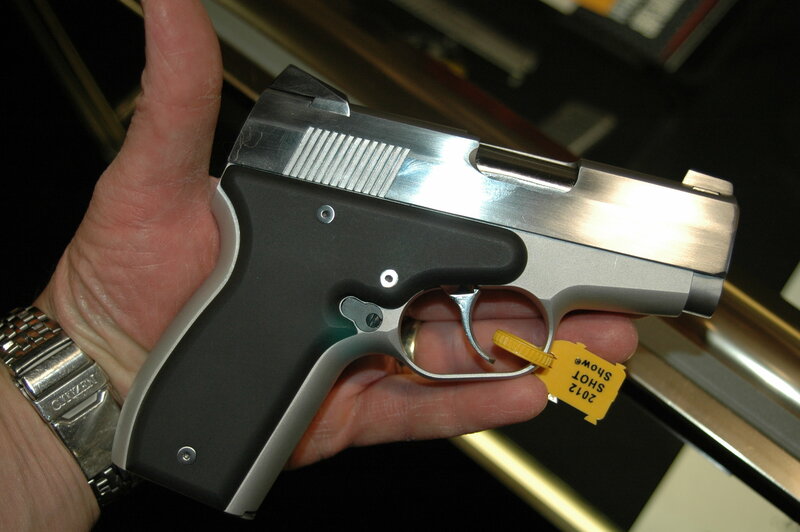 Any assumption that Rohrbaugh would try to make the smallest, lighest .45 ACP pistol was just that -- an assumption. I think Karl figures he has nailed the pocket pistol, and doesn't see the need to make a bigger one in a different caliber. The R45 is intended to be something different. So, what is the R45s selling point? Price is not established yet, but will be north of $2,000 and probably north of $2,500.